Nothing like beautiful, sunny spring days to put you in the mood for spring cleaning! Like most knitters, sewers and all around crafters, accumilating supplies for your hobbies is all too easy. From fabric to yarn, the idea of new projects can be so enticing, especially when you are surrounded by beautiful fiber and yarn. It is important still to take a step back and really itemize you stash. This, is what I have been in the process of doing. So far, I have been able to create lovely gifts and other pieces from randoms bits in my stash and assigned projects for a good majority of my yarn. First of my finished destash projects was the Aster tank top by Dawn Catanzaro for Quince & Co, made from four balls of discontinued Sahara yarn by Plymouth Yarns. It's really a shame that it has been discontinued as it was lovely to work with and a beautiful summer blend of silk, bamboo, and linen. With the pattern, I highly suggest it! It is very simple, with nice dart shaping detail in the back. I can't wait to make another! My second finished destashed project was using leftover yarn from the Boxy sweater by Joji Locatelli I made this January. I used amazing hand dyed, 8-ply, merino wool from Palouse Yarn Company for that sweater and had just the perfect amount left over for socks. 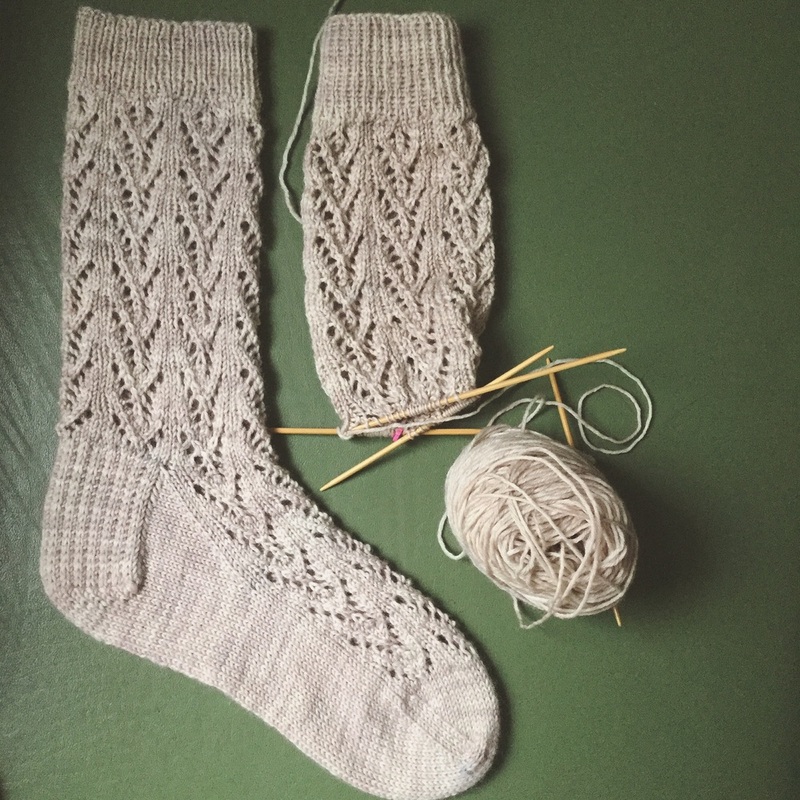 I used a free pattern on ravelry called Flying Arrow socks, which consisted of a very easy to remember, 10 st x 10 rows lace pattern repeat. I had a panic moment when I was nearing the end of the second sock and the yarn was dwindling, but ended up having, quite literally, the perfect amount of yarn. This pattern was a very easy pattern but since it was free, there is a bit of fill in the blank for some areas as it is not worded in the best way. I do highly suggest Eight Ply yarn by Palouse Yarn Company. It is superwash merino with a touch of nylon for durability. Please, for your own sake, always use yarn with a bit of nylon in the blend when making socks! Otherwise, you will get holes very quickly in the toe or heel. All in all, I am very happy with the outcome of these socks and see more socks coming from my stash in the near future. Finished and happy Flying Arrow Sock. My last finished stash project was the Serena Shadow Shawl by Antonia Shankland. Another quick and easy project that was able to use up a skein of Cestari and a random summer-like blend, no tag skein I found in the yarn cubbie. I ended up making it not quite as big as it will be used in a warm weather climate in the near future. This pattern was super simple and would be great for a beginner wanting to master some minimal shaping. The yarn overs are even other row and the only detail in the stitching is a single row of garter, which is simple to follow as you use a different color for those rows. Definitely recommend and could be worked in a warmer, wooly shawl with alternative yarns. I will be continuing my de-stashing projects throughout the spring and summer and keep you all up-to-date on various projects. Forewarning though, I have designated about 4-5 sweater patterns to yarn, so prepare for many sweater posts coming your way!